Preheat oven to 375°. 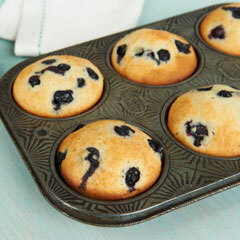 Grease 12-cup muffin pan or line with paper cupcake liners; set aside. Beat Country Crock® Spread and sugar in large bowl with electric mixer until light and fluffy, about 3 minutes. Beat in eggs and vanilla until blended, scraping sides occasionally. Alternately beat in flour mixture and milk just until blended, beginning and ending with flour mixture. Gently fold in blueberries. Evenly spoon batter into prepared pan. Bake 20 minutes or until toothpick inserted in centers comes out clean. Cool 15 minutes on wire rack; remove from pan and cool completely.